In the dying years of the 19th century a former Civil War surgeon, Dr Cyrus Teed founded a pioneer settlement on the banks of the Estero River, south of Fort Myers, where he led the community to practice a religion he termed Koreshanity. Chief among his beliefs was the equality of men and women and that the universe was a hollow sphere containing everything within it. Planning to build a utopian city, the community generated their own electricity, built boats, established a general store, and constructed numerous buildings of which 11 remain today to be explored by visitors. 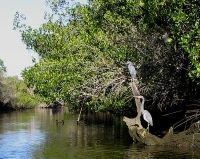 The last four members of the sect donated the land to the State of Florida in 1961 and it is now preserved as a park with a nature trail, picnic tables and campsite. Guided tours of the Koreshan buildings are offered.